Windows Update on Vista x64 Ultimate woke up today and told me I needed a new video driver. Since I was being very careful to not install anything unsigned or controversial, I didn't download any new drivers from the manufacturer's website. It seemed to me that when Windows Update told me it had a new driver available, they wouldn't be that big a deal to get this new driver. 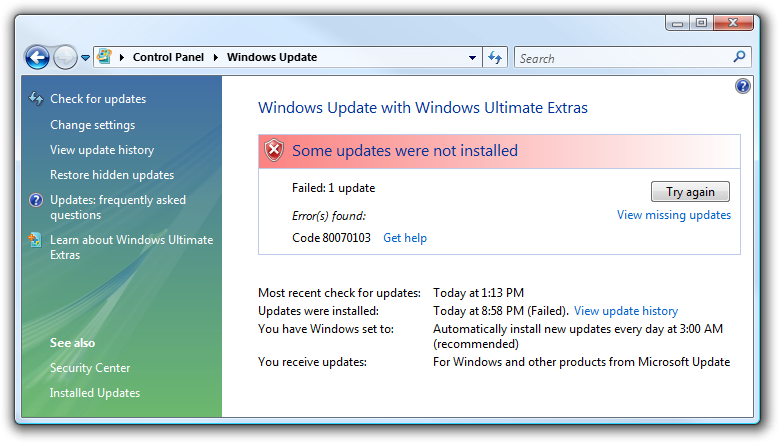 After much gnashing of teeth and flashing of my monitor, Windows Update announced that the update failed. Waa? That doesn't usually happen. I noticed the error code was a COM hResult with a link next to it. I though I was rid of those. Then I clicked the link and saw this. "Go to the Discussions in Windows Update website to see if someone else has found a solution or to request help from other Windows users." 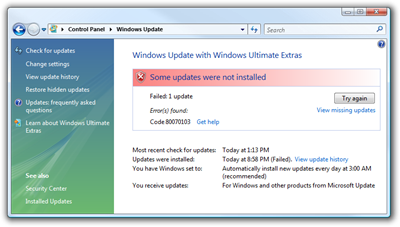 "If you receive Windows Update error 80070103 while installing updates, you might be trying to install a driver that is already installed on your computer or a driver that has a lower compatibility rating than one you already have installed." What's a driver compatibility rating? I would assume the Windows Update would only suggest compatible drivers that were the most not-controversial ones available. In my experience Windows Update tends to be very conservative in these things. Time to reboot and hope for the best. P.S. I dictated this entire blog post using the Windows Vista to voice recognition feature. Worked pretty well, and gave my hands a break. Any quickies as to what is the best 'free' option for Windows XP? Christian - But why not just tell me what's wrong? Isn't that more useful than an hResult? I have to agree with Scott on this one. I always present the user with something they can do to fix the error. If necessary, I log log an hResult or Exception behind the scenes. But there doesn't seem to be any use in presenting the user with cryptic information they can do nothing about.